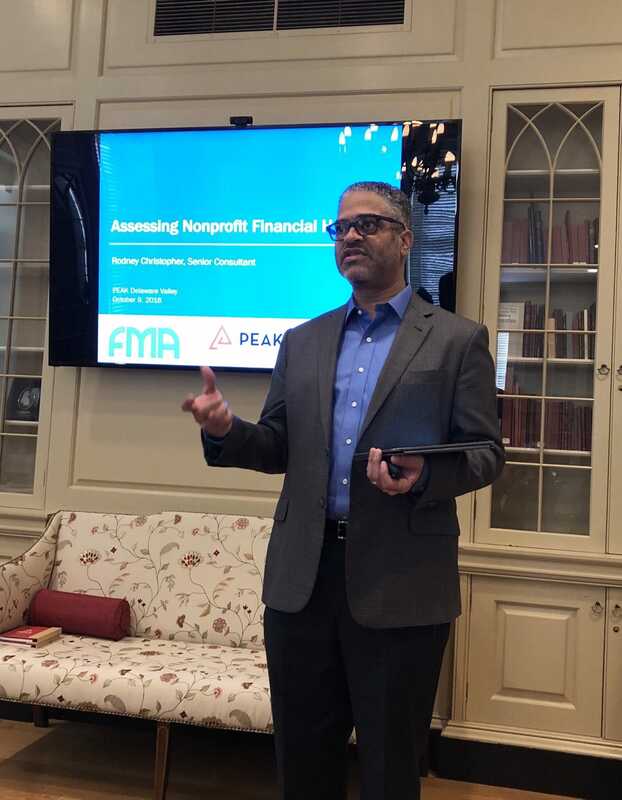 As a consultant at FMA, I provide training, consulting and coaching to build the capacity of funders to engage with grantees about their financial needs. I also conduct business development for the firm, and recently started as the lead on a major project working for and with a collaborative of five of the largest private foundations. Rodney gives a presentation to clients. To have lived the life I have is, in itself, an accomplishment I am proud of. I was raised on welfare by a single mom in a working class neighborhood of Brooklyn, and the odds were stacked against me in many ways. But I succeeded academically, and was building a nice career until a new obstacle presented: being diagnosed with a crippling mental disability. Learning I have Bipolar II disorder – and how to live with it reasonably well – has been the biggest challenge of my life, professionally and personally. I’m grateful to my long-time therapist, Dr. Philip Spivey, because it was he who helped properly diagnose me and ensured I had appropriate treatment, including what I call my “head meds” (I’ve learned it often takes much longer than in my case for folks with my condition to be properly diagnosed). Experiencing major depressive episodes for many weeks at a time during each of the four years till I was diagnosed, and once more in the middle of my first year of proper treatment, was soul-robbing. I was terrified that I would never be okay and capable of living a productive life. Somehow, I just kept trying. I was able to hide it for quite some time, but then I no longer could. I reached my lowest point and knew that if I did not admit myself to a psych ward I would have taken my life. It was just too hard to continue living with uncontrollable periods of deep depression, during which nothing was logical and I had no will to live. I was fortunate to have incredibly supportive bosses. I must single out Clara Miller, for whom I worked 18 years at two different places. Her ability to respond with concern and give me space to learn about and manage my condition is a major contributor to the fact that I am alive today. I had to pull back, slow down and focus on my health. Along the way, I discovered that my condition is hereditary. On both my mom’s and dad’s sides of my family I have had relatives on the bipolar spectrum—I lost two uncles to suicide. And I learned a sobering data point: 1 in 5 people who have my diagnosis ultimately take their lives. I have now lived for more than 11 years without a major depressive episode. I have had a lot of help and it has been a lot of work. I must remain vigilant about having recovery time from intense periods of work. Without it, I could easily enter a hypomanic phase. If I spend too much time there, I run a strong risk of plunging into a debilitating depression. And I must always have patience with periodic anxiety and low moods. Clara—at Nonprofit Finance Fund and the Heron Foundation—and now my bosses at FMA, have all supported my working 4-day weeks, which allows me to manage my energy. Prior to joining FMA, I did not have much confidence that a new employer would consider hiring me, given my disability and because working a 4-day week is what best maintains my health. I figured that companies structure jobs to be held by 5-day people, why would they be open to hiring someone at 80%? Yet, when I embarked on the search that led to my current job at FMA, I summoned up the courage to disclose my disability early in the process. I did so largely to release the pressure I knew I’d feel if I waited to mention it either just before or just after getting/accepting an offer (should I have been so lucky), only to learn at that late stage that it would be a problem for the firm to consider my condition a disability and to be willing to accommodate it. I’d much prefer to be disappointed early. Amazingly, firms expressed a willingness to allow me to work 4 days/week. I have continued to be open about my disability with the colleagues I work closest with. The folks at FMA have been, without exception, really supportive. Given that I am a consultant and trainer who works primarily from home it is extraordinary that I am supported and even encouraged to organize my travel in ways that allow me to manage my energy. Earlier in my career I wanted to become a CEO or founder of a nonprofit organization. My disability forced me to re-evaluate. Today, I can say honestly that I am living out my professional aspirations. I do work that I love and am told I do well. Ultimately, I am more grateful than proud—many great people and positive circumstances appeared throughout my life that were purely good luck.